In a previous blog post we looked at how Tomcat 8.5+ uses SNI to map certificates to the hostname of a request. Tomcat 8.5+ can go one step further and supports multiple certificate types for each host. This is most useful for supporting RSA with older browsers, while supporting ECDSA with compatible browsers. In this blog post we'll take a look at how to configure Tomcat with multiple certificate types. OpenSSL supports a large number of curves, but browsers typically only support a very small number. SSL Labs allows you to test your browser's support for named curves. In the screenshot below you can see the curves supported by Firefox 57: x25519, secp256r1, secp384r1, secp521r1. secp256r1 is the OpenSSL prime256v1 curve. To support both certificate types, multiple <Certificate> elements can be added to a <SSLHostConfig> element. When multiple <Certificate> elements are defined, each must have a unique type attribute. 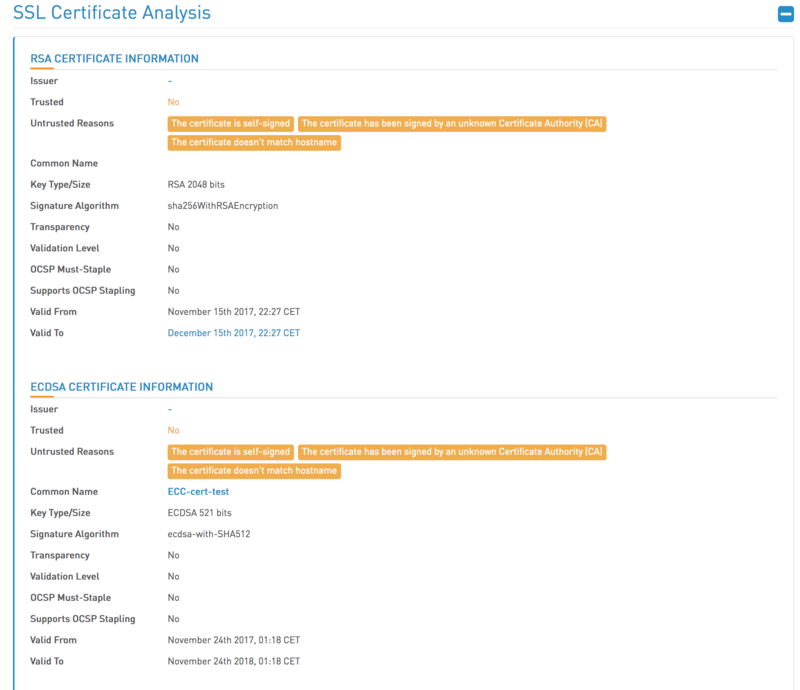 The RSA certificates have the RSA type, and the ECDSA certificates have the EC type. This is a snippet of the Tomcat server.xml configuration file with the two self signed certificates and private keys created using the OpenSSL commands above. This snippet uses the APR protocol, which accepts the PEM files that were created by OpenSSL. See Building the Apache Portable Runtime for more information on enabling APR in Tomcat. High-Tech Bridge has an online service for verifying the security configuration of a web server. In this screenshot we can see that the Tomcat server has exposed both the RSA and the ECDSA certificates. Tomcat is quite unique in its ability to support both RSA and ECDSA certificates for a single HTTPS port. This allows Tomcat to provide HTTPS to a wide range of clients without sacrificing security. This configuration can be achieved simply by defining two <Connector> elements with different type attributes.